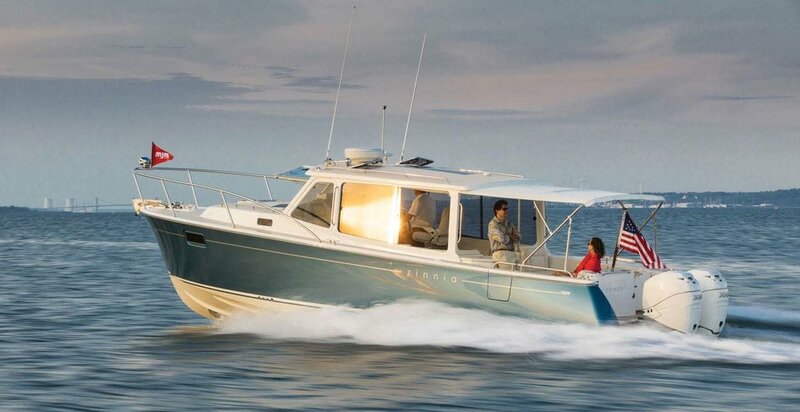 MJM yachts are known for their looks, and the new 35z is no different. The company’s newest model is also fuel efficient, boasting 1.2 mpg at 35 mph with its twin 300-hp Mercury Verados. Also standard are fully opening windshields, and joystick docking with Skyhook and autopilot. Below decks you’ll find elegant decor, including satin finished cherry accents, a galley with plenty of storage and more than six feet of headroom. See one at the Annapolis Powerboat Show (Dock B).